The Best Card Company was the go-to card manufacturer in the 90’s and early 2000’s when it came to MiLB licensed cards. They were based out of Austell, Georgia and issued some nice stuff, but in my mind they never rose to the level of Topps and Upper Deck. Although some of their cards can still bring in decent coin. Today they’re no longer around. At the time of their release, Stating Lineup was still the king of sports action figures. Best’s Heroes Of The Girdiron were a little easier to play with though because of their full articulation. But if I remember correctly, Starting Lineup had a series of fully articulated figures too. 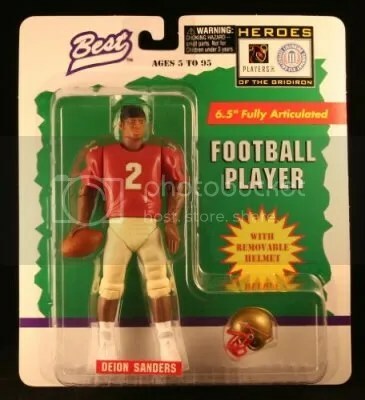 Best released another set of figures in 1998 under the same name. That set has 18 players. The line of figures released by Best never really took off like Starting Lineup did. All of the figures made by Best can easily be found online for $5.00 to $10.00. I’m sure there were some football fans that had these waiting under the Christmas tree for them back in 97 and 98. 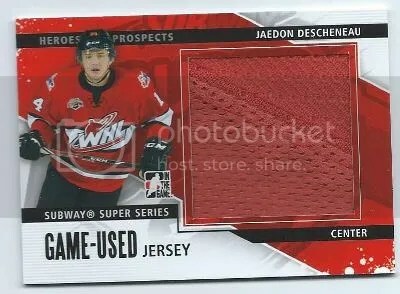 Congrats to Jamie Baldwin on being the lucky winner of the Jaedon Descheneau 13-14 ITG Heroes & Prospects Subway Super Series Black Version Jersey. 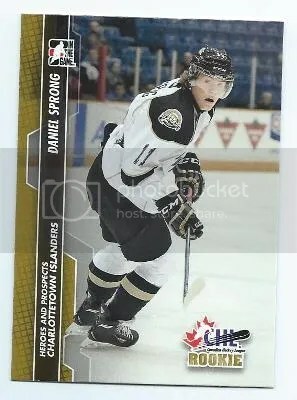 Once Jamie Baldwin sends me his mailing address, I will ship this card ASAP. Thanks! 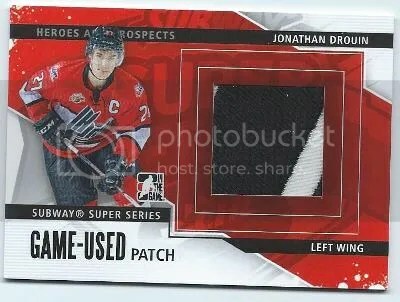 This contest is for a Jaedon Descheneau 2013-14 ITG Heroes & Prospects Subway Super Series Black Version Jersey. Good luck!!! This contest will end Friday, February 14, 2014 @ 8:00 p.m. EST. The 3D cards are still my favorite part of this product. They just look so darn good. 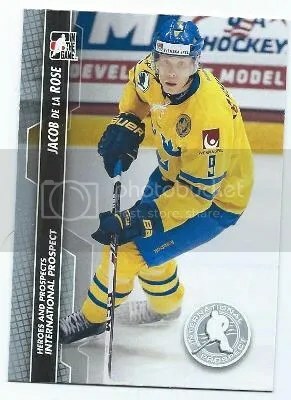 I swear it looks as if you could reach right inside the card and touch the ice. The base set looks very similar to previous releases, as do many of the autographs and relics. 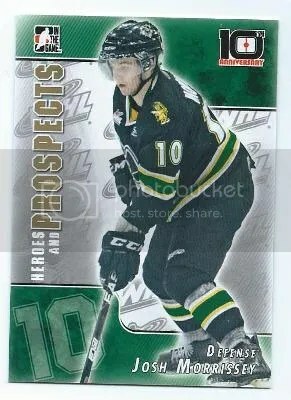 This being the 10th Anniversary of the Heroes & Prospects brand, In The Game created a special 45-card insert set that resembles many of the base cards found in the 2004-05 set. 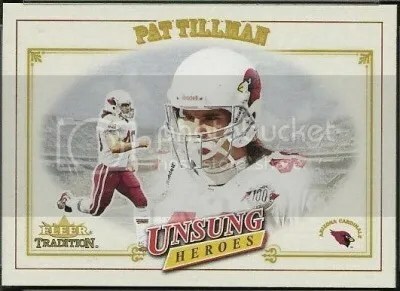 White boxes still stand out on most of the autographs, but ITG has been using those forever. Boxes are currently selling for $80.00. On average you’ll find (2) autographs and (2) relics per box, but there is a good chance for you to pull more. ITG sure does load up on the “hits” with this product. 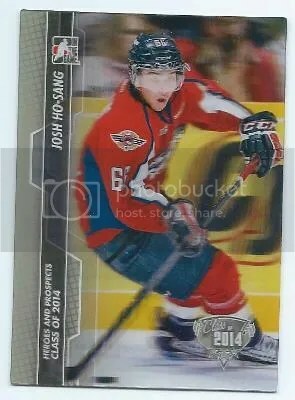 Overall, I give 2013-14 ITG Heroes & Prospects 3.5 ice cubes out of 5 (1=poor & 5=perfect). Ten years is a major accomplishment for a brand. Congrats ITG!! !